Imagine a married couple with three kids. Their names are Ken and Barbie, and they’re American workers in their thirties, previously employed in the real estate industry, and doing quite well until about 2007, when the real estate market crashes. Suddenly, two people who had been raking in a solid upper class income were making a third what they used to – and the only thing either of them really qualified for was work in the real estate industry. I think it would be fair to judge the couple for putting all of their professional eggs in one basket, but I don’t think we ought to judge them any more harshly than any of the other millions of Americans, who maybe knew the bubble was a bubble, but had no idea how small it would get when it popped. Little by little, the economic foundations of the lives Ken and Barbie had hammered together fell away. 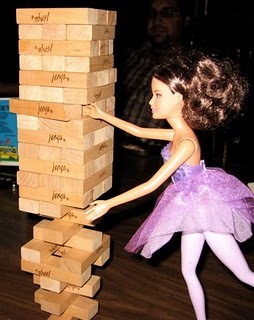 Like Jenga pieces being slid out beneath them, it was all doomed to come down. Health insurance premiums tripled – snick! Gas prices spiked – snick! Property values fell, foreclosures rose, gargantuan banks rumbled to ominous, creaking halts – snick, snick, snick! The two previously hard-working small-business owners who once worked a hundred hours a week between them were now down to thirty. The bills fell behind, they had to move from their house, their savings dwindled until they were lurching along, living from hand-to-mouth every single week. A check would come in, the checks would go out. And how was the job market again? Not too good. Unemployment was hitting double digits. Ken was able to keep an income going through the contacts he had, but for Barbie the market was dry. She was going to have to find work. She eventually tried temp jobs, and learned what minimum wage felt like. Learned what it felt like to look the possibility of wearing a Walmart uniform- for years, possibly – right in the eye. And then on a whim she walked into a finacial aid office at a state university, and asked them – is it possible I could ever go back to school? Anything to put a solution at the end of this slog through poverty, anything that even resembles hope? Yes, they said. No problem – you would easily qualify for student loans. In other words, you could borrow money that you don’t have, and spend it, right here in the bleakest financial time of your life that you have ever known, and then you could spend it on education. Counter intuitive, yes? That’s what we keep getting told as a country, right? That we’re super broke, so everybody stop spending. All of it. We’re broke, so no more nothing. And then let’s look where Ken and Barbie would be three or four years later in both scenarios. In the first scenario, Barbie works at Wal-Mart the whole time, making barely enough to scrape by, and nowhere in her future is there anything else. She arrives at the end of the three or four years with nothing to show for her work, and she is no more equipped to pull herself to a higher economic position than she was in 2007, and she’s barely contributing to society as a whole. Just grinding along as a cog in Walmart’s engine, growing sad and bitter and hopeless and tired. Then in the other scenario, which is truly a deficit spending scenario, she gets into school, applies herself with the same intelligence and energy and enthusiasm which made her successful in the real estate industry before it crashed, and instantly stands out academically. She is a nonstandard student, so her maturity and her children combined with her high GPA qualify her for grants and expanded loans – more money which she wouldn’t have if she locked herself down financially and refused to spend a dime. And it adds up to more than she would have made at Walmart, even after tuition. It really does. At the end of the three years, she has a degree, and graduate schools are courting her, and her family is proud of her, and her future is productive and modern. And she never – NEVER – could have done it without deficit spending. Without borrowing from the future – precisely to avoid a future she didn’t want. This future was not just better for her, and for Ken, but also to society as a whole. Do you think we’re better off with more career Walmart workers making minimum wage, or with educated professionals moving themselves and the rest of us forward? Which one pays more taxes, if you’re feeling pragmatic? Which one is more likely to need food stamps, do you think? Multiply Ken and Barbie by tens of millions, and that’s the debate you’re watching in Washington right now. Those are the two futures for working class families, currently being debated by millionaires, all of whom will be absolutely, perfectly fine either way. I’m all for the education. And would really have loved to see you set up and take that barbie pict! However, the debt of student loans and the burden that has put on a hard economy is being hyped as the next bubble to burst. Not saying Walmart is better, or food stamps or whatever, just saying that even with that diploma and lots of degrees after my name I’ve landed on tough times where I couldn’t make ends meet, let alone pay my student loans. There are many other sides to consider. Certainly not just any degree is going to give Barbie a happy ending. Right now specialized education, technology, and medical support are degrees she would want to go after in this scenario. And certainly it’s not time for Barbie to get an English or Philosophy or Art History degree! 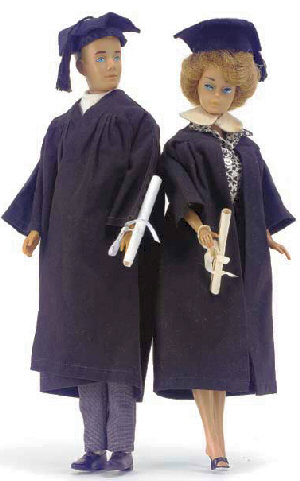 The point is, Barbie’s better off educated, and the working class is better off educated. Neither of them would have been better off with nothing.